There are literally thousands of hiking possibilities within the boundaries of Death Valley National Park, ranging from sub-sea level trails to trails rising thousands of feet above sea level. This is an amazing park to explore by foot, just make sure that you plan and prepare adequately. Temps can dangerously hot for much of the year in this area, and if you do not bring plenty of water, and take other necessary precautions, an afternoon hike could become fatal. 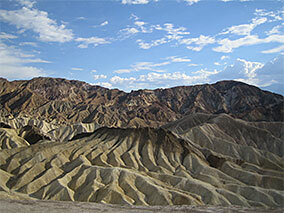 There are tens of thousands of beautiful sites to see in Death Valley National Park. One of the best ways to explore the park is via mountain bike. Death Valley is especially popular for mountain bikers during the winter months, when it is too messy or too cold to mountain bike in other areas of the country, that is when Death Valley comes alive!